Holy biscuits and gravy do I love the Entangled group! Jus Accardo’s DARKER DAYS is another Entangled book that I absolutely loved. 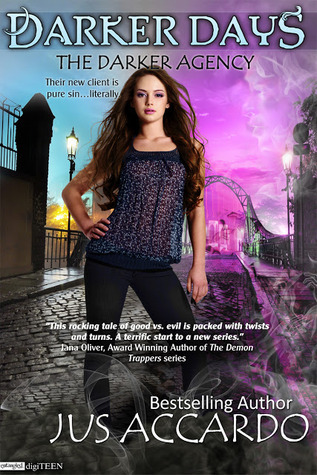 Jessie Darker is NOT your typical teen. She’s not even a ‘normal’ one, but I won’t get into that for fear of dropping too many spoilers. Nana nana boo boo! Jessie works for her mom at the Darker Agency, which is a PI office of sorts. But they also specialize in some of the ‘darker’ aspects, such as zombies, demonic possessions, and any other thing that goes bump in the night. The Darker gals are at the top of their game, but when someone finds, and opens, a box containing the Seven Deadly Sins, all best are off! If you are a fan of Miss Jus’ DENAZEN series, you will love DARKER DAYS. Jus has a fantastically twisted brain that I just love. She’s created a world that isn’t like anything I’ve read (so far) and was a pleasure to immerse myself in it. The town of Penance (total tongue in cheek moment) has all your everyday stuff: high school, the wrong side of town, the better side of town, deep rooted history, and all that jazz. Unseen by most, and what the Darker Agency keeps a tight lip on, is the ‘other.’ Penance also has witches, weres, necromancers, and a healthy dose of demonic activity. When the box of sins is opened, it all goes to hell in a hand basket. Our leading lady, Jessie, is a hoot and a half. She’s a self proclaimed “spunky” type of girl who definitely walks the walk. Jessie actually reminds me of Alex from HALFBLOOD or Rose from VAMPIRE ACADEMY. She’s tough, she’s got a serious mouth on her, and she’s simply wicked with quartz powder. Her mom trained her to take care of the ‘alternative’ cases the Darker Agency acquires, which happen to be Jessie’s favorite. But Jessie isn’t without faults. She tends to DO before she THINKS and it often gets her in above her head. Jessie also holds many people, especially boys, at arms length because the “L” word is something of which she wants nothing. And then she meets Lukas. Tall, dark, mysterious, and dare I say hot? Oh and he needs their help! Without giving too much info (no spoilers), I will say that Lukas has some serious intel on the box of sins and needs the Darker girls’ help to track it down. Right off the bat, I liked Lukas. Despite Jessie’s ogling eyes, he was very adamant about hiring Jessie’s mom, not her. Ouch! Lukas is your down-home old-fashioned guy. He doesn’t always ‘get’ Jessie, but the two find some common ground and eventually hit it off. Speaking of old-fashioned, probably one of my favorite lines from DARKER DAYS was “‘I don’t spit anything, and I’m not sure what pissy beams are, but I’m fairly sure I don’t do them.’” Lots of laughing. Out loud. To add to Lukas’ hotness factor, let’s just say he has some anger issues, and Jessie’s mojo is the only thing that seems to help him. SWOON! DARKER DAYS was full of action and just enough swoon-worthy moments so it didn’t feel like a Bourne movie. Jus keeps us guessing throughout the whole story. She never gives us the whole deal and continues to drop important details to the plot/story as the time is right so as to not be overloaded. And believe me, there was tons of detail. The visuals were awesome and though Penance is a totally fictional place (I think), I had this revolving image of East Village New York. But that might just be me. When the time came to cross over to the Shadow Realm, I was not disappointed. Jus weaves this sort of Tim Burton-esque world full of simply wicked visuals of dripping walls and rotten teeth. Overall, the only part of DARKER DAYS I wasn’t too keen on was the similarities with the DENAZEN characters. Granted, (small confession time) I’ve only reach TOUCH so far, but the main characters of both books had parallels. But I didn’t mind too much as I really enjoyed TOUCH. There were just enough differences to make them not repetitive in nature. In any event, DARKER DAYS is a nice twist on the norm, and not so norm, we live in. The action is breathtaking and the humor is second to none. Jessie is the kind of character I want to root for, and Lukas the kind I want to crush on. Even Jessie’s mom plays an integral part to the story and she’s 100% in Jessie’s corner, despite her daughter’s tendencies to break ALL the rules. Get DARKER DAYS. Read it. Love it. Douse the pissy beams, just do it! Sign into Goodreads to see if any of your friends have read Darker Days.